Born in Prussia in 1830, Dellschau worked as a butcher before moving to the United States in 1849, living in Galveston, Texas, Sonora, California, and eventually settled in Houston, Texas. Just before retiring from his work as a salesman in a Houston saddle shop in 1900, Dellschau began work on a memoir recounting what he claimed to be his adventures in California, completing it in 1903. Working alone in a family member's attic, he began work on the first manuscipt of what would be a 12-volume series. Evoking a steam-era adventure aesthetic reminiscent of Jules Verne, this epic narrative follows his alleged adventures as a member of a secret society called the Sonora Aero Club, a group of maverick inventors engaged in designing and flying airships propelled by a mysterious, anti-gravity gas. McEvilley, Thomas, Roger Cardinal, James Brett, Thomas D. Crouch, Barbara Safarova, Randall Morris, and Tracy Baker-White, Charles A.A. Dellschau, Seattle: Marquand Books, Print, March. Crenshaw, Dennis, The Secrets of Dellschau: The Sonora Aero Club and the Airships of the 1880s, A True Story, Charlottesville: Anomalist Books, Print, October. Onion, Rebecca, "Steampunk Before Steampunk Exitsed: Charles Dellschau's Fantastic Airships," Slate, Web, 18 March. Rosen, Rebecca, "Charles A.A. Dellschau, Dreams of Flying: The Amazing Story of an Airship Club that Might Never Have Existed," The Atlantic, Web, 21 March. "The Sonora Aero Club Imagined and Illustrated," Global Lighting, Web, 30 April. Greenwood, Cynthia, "Secrets of the Sonora Aero Club," Houston PressPrint, 10 December. Reif, Rita, "Arts/Artifacts; A Saddler Who Dreamt of Flying Machines," New York Times, Print, 25 January. 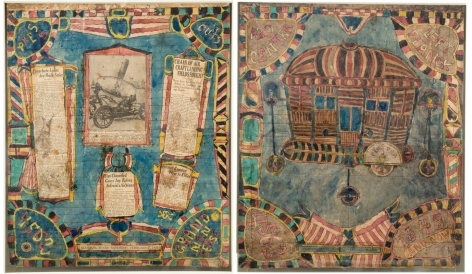 volume or walking through an exhibition, which presents pages out of context, one is repeatedly confronted with a nostalgic celebration of steam-era adventure and a scathing critique of the destructive use of contemporary flight technology during World War I.
Dellschau's status as one of the preeminent Outsider Artists owes to his entire production, including his use of 19th century literary strategies such as the use of code, which continues to baffle scholars intent on proving the existence of the Dellschau's airships. Houston artist Pete Navarro spent nearly 30 years sleuthing this airship mystery, and has contributed much to our understanding of Dellschau without offering a conclusive claim. Perhaps the answer to this mystery is staring us in the face: the artist often penned the word "Humbug" on his pages. To us, this sounds like a curmudgeoun's epithet, but to the steam-era readers of Edgar Allen Poe's penny paper capers, this word simply meant "hoax."